Promotional lanyards & printed keychains make such popular promotional products and the ones made from polyester are weather resistant and keep their shape, making them incredibly durable. The eternal search for the key in your bag is finally over. These promotional classics can be customised in a plethora of ways, they have different widths to choose from and using sublimation printing, can be customised with the corporate artwork of your choosing. The amount of style and colour choice makes these personalised items very fashionable! All of our printed lanyards come with a safety clip to ensure users can’t experience suffocation and in times of high pressure, the clip open automatically. These also make brilliant additions to gift sets, these could contain promotional keychains, pens, USB drives, printed wristbands, a pen holder and other keyrings. Every time your clients reach for their keys, they will see your business logo on these promotional lanyards, increasing your brand awareness. Personalised lanyards make the ideal give-away items and can be used as part of themed custom gift bags. Help your clients end the search for their keys with our promotional polyester lanyards. As an everyday item, the lanyard is as useful as they come. Most people use it to keep their items close to their body, so a world without lanyards is unimaginable! Keys will always be to hand and safely around the neck with the promotional lanyard. The plastic detachable buckle also means it can be easily removed. There are many other items that can be attached to a lanyard, such as mobile phones, USB sticks, ID cards or event passes. With their high user value and practicality, its no wonder that lanyards are one of the most popular promotional products in Britain. The low unit cost of these items also means you can order in bulk and use them for all your business events without fear of huge financial cost. A large advertising space and a long product life cycle are a few more benefits flat polyester lanyards have to offer. Use the printed polyester lanyards as advertising material to increase awareness of your brand. The printed flat polyester lanyards have a large advertising effect. The history of this product started in the 15th century in France. Back then, lanyards were part of the military uniform and were used to secure guns, swords and arrows as close to the uniform as possible. They were called ‘lanière’. Even in the centuries that followed, lanyards stayed part of the uniform for decorative reasons. In countless western films, lanyards are part of the official uniform of cowboys as well as government officials and are often used as a status symbol. Colours and patterns were not part of a corporate design back then, but instead were used to show the qualifications as well as the rank of the wearer. Only as early as the 70s, have people started using lanyards as promotional items. This fact can be traced back to the constant use of lanyards at concerts and music events. Back then, they were being used to carry backstage tickets as well as ID cards. Nowadays lanyards can be seen at almost every event! Making them the perfect merchandise to apply your business logo to. Promotional keyrings are effective marketing products for many reasons. Their high user value means that your clients will be using these personalised Polyester products on a daily basis. When printed with your logo or slogan, they draw attention towards the company and through repeated use, people remember it. The tactile nature also helps the recipient to generate memories faster and keep your company in their minds for years afterwards. A study showed that when people see promotional merchandise, 78% of them remember the name of the brand and the company behind it. 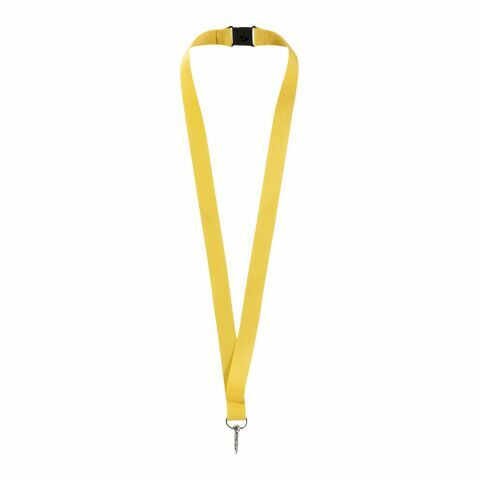 Moreover, lanyards have large advertising space and are worn around the neck which is a highly visible place to advertise. Their practicality and association as a fashion accessory means the target demographics of this promotional merchandise are huge, widening the amount of potential clients for your business. Advertising with polyester lanyards will promote your business in an effective, but crucially, subtle way. Let these personalised polyester lanyards be your cost effective and powerful brand ambassadors. This personalised product made out of polyester is ideal as a small gift to customers and business partners. It will generate a lot of memories and strengthen your relationships in the business world. These small, thoughtful gifts will give you a positive reputation and ensure your company is constantly remembered without making any active advertising efforts. Polyester lanyards will multiply your advertising effect all on their own. Polyester is a plastic based material, which can be used for many different things. As the most known synthetic fibre worldwide, its easy to see why it’s the choice material for so many products. They have been used since 1947 in the clothing industry, mostly as part of a mix, consisting of 55% polyester and 55% wool. These keyrings are lightweight and weather resistant, they are easy to care for and they keep their shape. Promotional products made out of polyester are also almost non-flexible, which will not damage the print in any way. The incredible durability of these products means your business logo will be around for many years, and will create thousands of brand impressions in that time. We stock different width options (10mm, 15mm, 20mm and more!) but generally speaking, these lanyards are 90 cm long and have a half-twist at the end, so they can lay flat against the body. In our web shop, we offer personalised lanyards with a width of 10mm to 25 mm. Additionally, the integrated clip made out of metal or plastic, is the perfect link to carry keys and ID cards. For safety reasons, every lanyard comes with a safety clip, which serves the purpose of preventing suffocation and in case of high pressure, automatically opens itself. Through silkscreen printing, these keyrings can be personalised with your business logo, slogan, or both using sublimation printing techniques. With our pantone colour-matching assistant, you can choose from thousands of colours to perfectly match your corporate design. The promotional experts at allbranded will advise you on every question you might have and help you with the design and style of your personalised lanyards!